ULC is blessed with a vibrant music ministry. ​If you love music and want to join our growing music ministry there are plenty of openings and choices for all ages. The ULC Senior Choir is directed by Janine Novenske Smith. Membership is open to all ages high school and older. The choir rehearses every Thursday from 7:30 to 9 pm from September to May. The choir sings at the 10:45 am worship service throughout the academic year, and at the 8:30 service on holidays. Rehearsals are held in the choir room in the rear of the Fellowship Hall located in the lower level of the church. Each year the senior choir recruits and sponsors four college students to sing in the choir and sing parts of the liturgy during worship. This year, a fifth student will be leading the children's choirs. Interested students are encouraged to contact Janine Smith to audition for next year's openings. (Pictured from left to right: Kelly Lofton, Taylor Mills, Alyssa Handspike, Zack Sneed and Adam Krause). The ULC Handbell Choir is directed by Louise Paquette and performs at selected services. Rehearsals are every Thursday from September through mid-April from 6:30-7:30 pm. No prior musical experience is required, and new ringers are always welcome. For more information about the Handbell Choir, contact Louise Paquette. 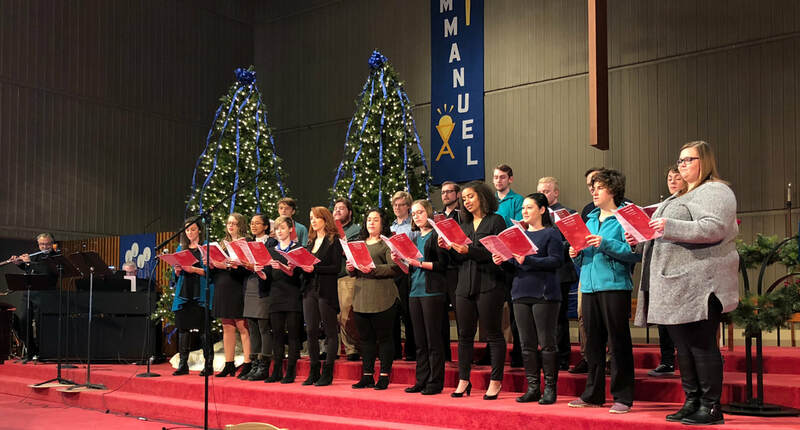 Our college and young adult singers debuted at Pastor Haley Vay's installation service in May 2018, and performed at the bluegrass service in August 2018, the folk rock service on Alpha Sunday 2018 and the Jazz Worship service in December 2018. All interested singers are encouraged to contact Pastor Haley Vay for more information. Built in 1866 by S. S. Hamill for Second Universalist Church in East Cambridge, MA. In 1907 Second Universalist Church closed; and the organ was sold to Hillside Universalist Church in Medford, MA. Under the guidance of long time member Paul Schneider (1917-2000), the organ was relocated to ULC in 1985. where it was enlarged and rebuilt by Dana Hull. The organ has been in regular use since it was dedicated on January 6, 1985. Our Youth choir is is intended for youth in 2nd - 5th grade. The Youth Choir sings at selected services, and performance dates are announced. Contact the Director of Music for current rehearsal schedule. Cherub Choir is directed by a scholarship student and is for children age 3½ through 1st grade. The cherub choir sings at the 10:45 am worship service once each semester. Rehearsals are held the three Sundays immediately prior to the performance date. Contact the Director of Music for the current rehearsal/performance schedule. Every summer ULC music staff lead a week long music camp for children ages 3rd grade through middle school. Choir, Recorder, Handbells, Choir Chimes and Sign Language are some of the topics that have been offered in the past. ​REGISTER HERE for our 2019 Music Camp June 17-20, 2019.